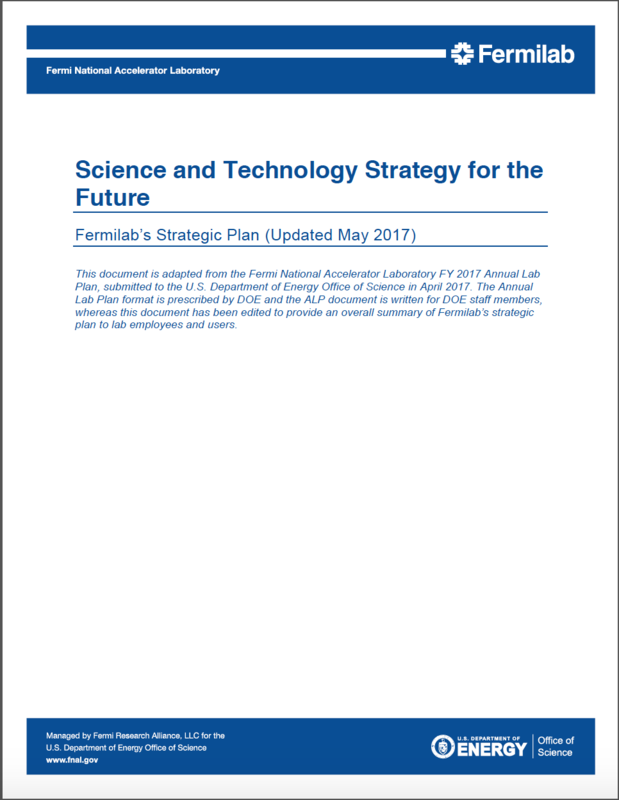 The laboratory’s strategic planning process includes the development of lab goals and objectives, defining lab activities funded for the current fiscal year, and communicating the plan to lab employees, the science community, and funding agencies. We use this process to satisfy an annual Department of Energy Office of Science (DOE/SC) requirement to provide an updated version of the laboratory’s strategic plan. The plan is referred to as the Annual Lab Plan. A draft version is submitted to DOE/SC in the spring, and the final version is submitted in mid-summer. The plan is also presented by the Lab Director in face-to-face meetings with DOE/SC leadership in early summer. From DOE’s viewpoint, strategic planning is an annual process in which the agency engages its laboratories by asking senior management to “define an exciting, yet realistic, long-range vision for the future.” This provides the starting point for discussions between DOE/SC leadership and senior management about the laboratory’s future directions, strengths and weaknesses, immediate and long-range challenges, and resource needs. DOE’s goals for these discussions are to understand the direction in which laboratory leaders wish to take the laboratory, and to develop a shared understanding of how laboratory plans are aligned with DOE/SC’s long-range science priorities and operational goals. The Annual Lab Plan is the document that is used to develop this shared understanding. The DOE provides detailed instructions for the document and asks for information on laboratory core capabilities, the lab’s strategic plan and major initiatives, infrastructure, human resources, budget process and cost drivers, and strategic partnership projects related to technology transfer and commercialization. Fermi National Accelerator Laboratory is an international hub for particle physics located 40 miles west of Chicago, Illinois. Fermilab’s 1,800 employees and more than 2,600 users drive discovery in particle physics by building and operating world-leading accelerator and detector facilities, performing pioneering research with national and global partners, and developing new technologies for science that support U.S. industrial competitiveness. Fermilab’s science strategy for the future delivers on the U.S. particle physics community’s goals as outlined in the Particle Physics Project Prioritization Panel’s 2014 report (P5 report). The strategy’s primary ten-year goal is to establish a world-leading neutrino science program anchored by the Long-Baseline Neutrino Facility (LBNF) and Deep Underground Neutrino Experiment (DUNE). The flagship facility comprised of LBNF and DUNE will be the first international mega-science project based at a Department of Energy (DOE) national laboratory and is the largest new particle physics project being undertaken anywhere in the world since the Large Hadron Collider at CERN. Fermilab’s particle accelerator complex is the only one in the world to produce both low- and high-energy neutrino beams for study. Fermilab integrates U.S. universities and national laboratories into the global particle physics enterprise through its Large Hadron Collider (LHC) programs; accelerator science, neutrino science and precision science programs; and dark-energy and dark-matter experiments. Large-scale computing facilities drive research in particle physics and other fields of science. The laboratory’s R&D infrastructure as well as its engineering and technical expertise advance particle accelerator and detector technology for use in science and society. Fermilab’s partnerships and technology transitions programs, including the Illinois Accelerator Research Center, leverage this expertise to apply particle physics technologies to problems of national importance in energy and the environment, national security, and industry. Fermilab’s primary ten-year goal is to establish a world-leading neutrino science program led by LBNF and DUNE and powered by megawatt beams from an upgraded and modernized accelerator complex. This national flagship particle physics initiative will be the first-ever large-scale international science facility hosted at a U.S. DOE laboratory. Identified by the U.S. particle physics community in its consensus P5 report as the highest-priority domestic construction project in its timeframe, LBNF/DUNE is attracting global partners willing to invest significant financial, technical, and scientific resources. A five-year program that includes current and near-term neutrino experiments and an R&D platform that serves the wider neutrino physics community is driving the development of capabilities and bringing together the international community needed for LBNF/DUNE. Fermilab’s success in operating both low- and high-energy neutrino beams, its core scientific and technical capabilities, its project management expertise, and its international reputation as an excellent scientific partner are making it the destination of choice for the world’s neutrino researchers. Artist’s rendering of the Long-Baseline Neutrino Facility (LBNF) that will send a very intense beam of neutrinos 1300 km (800 miles) to a massive liquid-argon detector located deep underground in the Sanford Underground Research Facility in South Dakota. Over the next decade Fermilab will continue to be the leading U.S. center – and the second leading center in the world – for Large Hadron Collider science, enabling leading roles for U.S. scientists in future LHC discoveries and driving key contributions to upgrades of the LHC accelerator and the Compact Muon Solenoid (CMS) detector. The start of the Muon g-2 and Mu2e experiments will turn Fermilab into the world center for the study of muons, particles whose properties may open a window onto new physics. Fermilab will support the community-endorsed diversified approach to dark matter detection, including key roles in the Generation 2 dark matter projects. The laboratory’s leading role in the Dark Energy Survey, supporting roles in its successor experiments and involvement with the South Pole Telescope will ensure continued U.S. leadership in the study of cosmic acceleration. In partnership with academics from nearby universities and colleagues at Argonne National Laboratory, Fermilab will establish Illinois as a world center for advanced accelerator research with a suite of unique test facilities and R&D programs that will drive major advances in accelerator science and technology. Fermilab’s four core capabilities define the scope of the laboratory’s science and technology strategy. Major initiatives identified within each of the four core capabilities represent the focus areas for the majority of the laboratory’s time and effort over the next 10 years. A “Building for Science” theme focuses on major initiatives related to people, infrastructure, and R&D to support the strategy. The graphic above illustrates how the lab’s core capabilities and major initiatives comprise the strategy focused on scientific discovery and innovation. The laboratory’s four core capabilities are leveraged to deliver on DOE science priorities. High-intensity particle beams are used to answer compelling questions in neutrino science and reveal new physics phenomena through high-precision tests of the Standard Model of particle physics. High-energy particle beams are used to discover new particles and probe the architecture of the fundamental forces of nature. Underground experiments as well as telescopes are used to uncover the natures of dark matter and dark energy and probe the cosmic microwave background. The 2014 report of the Particle Physics Project Prioritization Panel (P5) identified the long-term science priorities for the U.S. particle physics community, and the laboratory is executing its strategic plan in alignment with P5, DOE, and the science community.